Welcome to the University of Montana! We are excited to have you join us in the Residence Halls this fall and want to provide additional information about move in. What is needed for check in? What should I bring for my room? What can't I bring for my room? The first official day of fall housing is Saturday, August 17, 2019. On opening day, August 17th, all residents will check in at the building they have been assigned to. Check in desks will open at 8:30 am on August 17th. If you arrive after August 17th, you will check in at your area desk. If you plan to arrive later than Sunday, August 25, 2019, please contact the UM Housing Office so we can continue to hold your room for your arrival. Students will need to have their Griz Card or a picture ID to check in. Their Griz Card will provide access to the front door of their Residence Hall. If they do not have their Griz Card yet, students should request an outdoor access card to use until they get their Griz Card. Outdoor access cards are meant to be temporary and should be returned within 7 days. 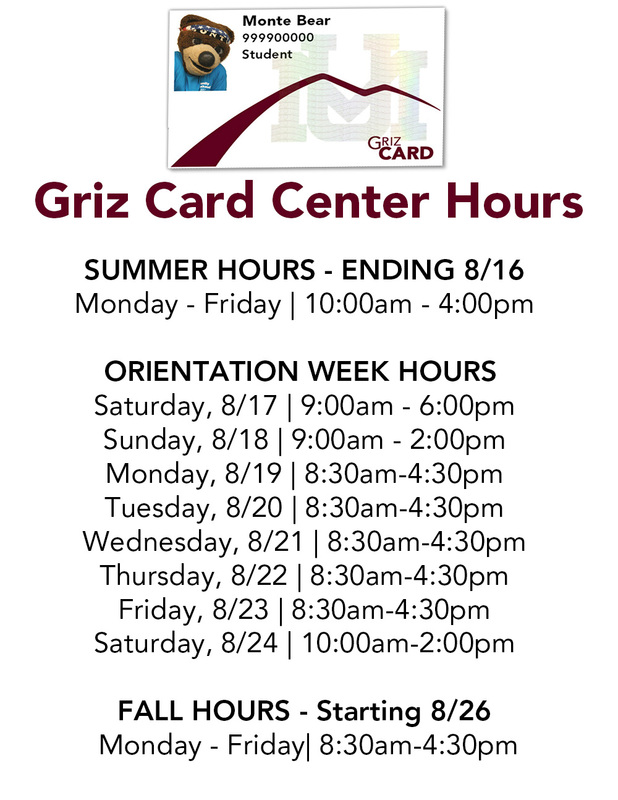 If a student still needs to get their Griz Card, please visit the Griz Card Center website for information about their availability during move in. Please note that only the student can check into their room. Parents can not check in or pick up keys for students. The UM Police Department oversees parking at the University of Montana. There will be additional short term parking locations available near the Residence Halls for move in. We encourage students to be mindful that move in is a busy time, and to not leave their vehicles in "quick stop" parking spaces for longer than the allowed time period. Please note that reserved, accessible, quick stop, no overnight, and hourly parking spaces will be enforced during move in. Be aware of where you are parking to avoid a parking ticket. All Residence Halls are equipped with standard twin-size beds, desks, dresser, closet, chairs, bookshelves, overhead light, network connection, and a wastebasket. Pantzer Hall suites' common living area also has a refrigerator, microwave, large storage closet, a furnished living room, and two bathrooms. Miller Hall pods also have a refrigerator, microwave, and a living room furnished with a two-seat sofa and sofa table. Miller Hall singles also have a refrigerator and microwave. Electrical appliances for cooking are not allowed in any of the buildings. This includes electric burners, George Foreman Grills, toasters, toaster ovens, etc. Exceptions are made for hot air poppers, coffee pots, hot pots, and microwaves. The UM Housing Office assumes no responsibility and provides no insurance or financial protection for students' personal property. By not carrying protection while on campus, you understand that you are fully responsible for your personal property and any damages you cause while living on campus. GradGuard Renter’s Insurance is a smart investment for college students and their families. With the GradGuard Renter’s Insurance plan, personal items that are stolen or damaged by a covered cause of loss can be replaced, subject to a $100 deductible. GradGuard Renters Insurance also protects students financially from large scale, unintentional damage they may cause to their residence hall or bodily injury they may cause to others for which they are legally liable. Low $100.00 Deductible. Compared to $500, $1000, or more for a typical homeowner’s insurance policy. Personal Liability Coverage. If you cause damage to university property or injure others, you may be liable for the damages. Renters Insurance from GradGuard provides up to $300,000 in personal liability coverage. For example, if you unintentionally set off your building’s sprinkler system, liability protection can help pay for the resulting damages. 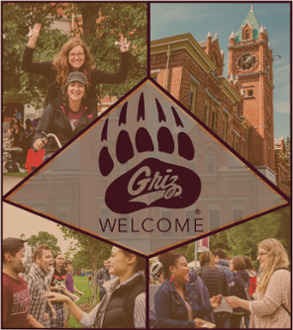 Griz Welcome is a series of events providing opportunities to become familiar with campus, get involved, meet other students, and have fun as Fall classes kick off. Griz Welcome is our way of making incoming students feel comfortable and at home. During this time, students will participate in our Fall Orientation which includes information about class registration, residence halls, financial aid, and more. We will also be offering services to students like Move-in Crew that will help freshmen move into their new home away from home. A variety of different activities are put on in order to welcome incoming students to campus as well as to their new community - beautiful Missoula, Montana. For more information please visit the Griz Welcome webpage. Students wishing to ship items to themselves may do so. We request that students ship their items to have the package arrival date be as close as possible to their move-in date so the student is able to pick up their package upon arrival. Storage for packages is limited within the Residence Halls. Please do not ship anything to arrive before Monday, August 12th, as the package may be returned to sender as mailing addresses are not in effect until this day. If you have any additional questions regarding move in, please contact the UM Housing Office at (406) 243-2611. We are open Monday-Friday from 8:00 am-5:00 pm.